My experience with soundports: Sound portals are a bit strange at first because you’ll hear a whole new range of overtones, not to mention a volume increase while you play. However, I find it a bit odd because who ever hears a guitar that close-up? It’s like putting your ear right next to the sound hole. Nevertheless, it’s great for chamber music so the other musicians can hear me on the stage (or so I can hear myself!). Since the portal projects sound in a direction other than straight toward the audience, everyone on stage can hear me. However, this often made me feel as if I was playing too loud all the time. Some observers in audiences have commented on increased volume when I opened the portal but I suspect this aspect is minimal at best. Maybe sound waves bounce around the room a bit more in different directions? Maybe the best reason to have a sound portal is that it gives you a confidence boost. It might deceive you too, making you think you are playing loud when in fact you are not. However, it sure can be nice if you’re practicing in a dead sounding room. Magnetic Portal Covers: An excellent solution to the pros and cons are to get a magnetic portal cover so you can close the portal or even have it half open. Then you have the option of the portal but only when/if you want it. See a small video of the magnetic soundport on my Scott Guitar via Instagram. Please note: The quotes below are brief and therefore often a bit out of context so follow the source link and read what the luthier or player has to say. 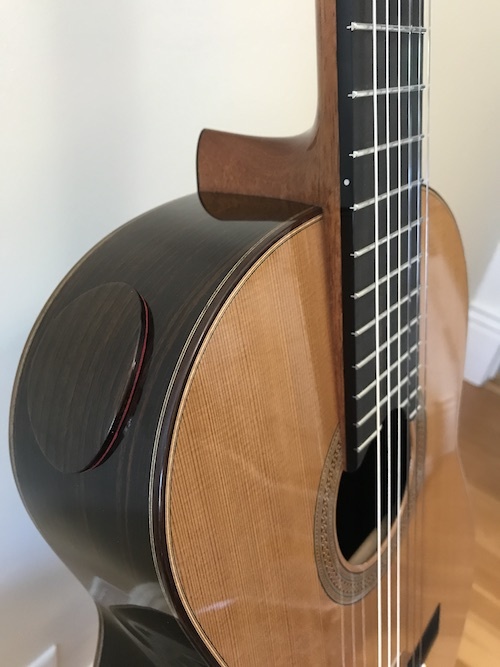 Acoustic ports function something like the soundhole in that they work in partnership with the inner air resonances of the instrument to release sound from the instrument. But the sound that comes from the port is primarily (if not entirely) for the player’s benefit, allowing the player to hear the sound of the guitar more completely. In modern, highly projecting guitars, this is particularly beneficial. Soundports help the player hear the guitar, obviously. This can be useful in ensemble situations, on stage, or if the player simply wants to hear more of the guitar. Good concert guitars are built to project the sound outward, and sometimes this can compromise the “near field” sound. Soundports can help compensate for any near field weakness. 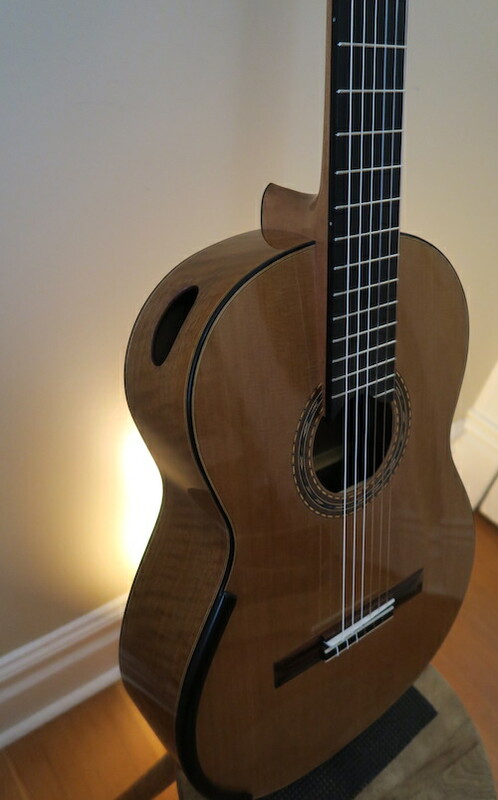 Guitars made with really thin sides, like those built on a Torres design, do not really need a soundport, because the sides are so thin that they already resonate quite a lot of sound toward the player. Guitars with thicker solid sides, laminated sides, or that have a laminated back, will sound better to the player with a soundport. The overall result was that opening a port seemed, in my tests, to give perhaps a 1-2% increase overall in power. This is not much: it takes a near doubling of power for a sound to seem twice as loud if the spectrum remains unchanged. Interestingly enough, the amount of the volume change did not seem to vary much with increasing port size. Apparently the broad band decrease tends to balance out any narrow band increases. I found this abstract and citation via liutaiomottola.com, if anyone has read the article leave a comment below. 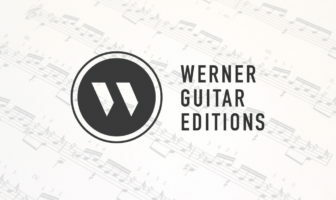 A blind listening evaluation of classical guitar soundports was performed to ascertain whether players could hear the difference between an instrument with an open port and the same instrument with a closed port, all in a context that is representative of a player’s instrument selection decision. The study was conducted to comply with the specifications detailed in standard ASTM E 2139-05, Standard Test Method for Same-Different Test from ASTM International (formerly called the American Society for Testing and Materials). Twenty four guitar player subjects were recruited to play a single guitar twice while blindfolded. In each of these two trials the open/closed port configuration of the guitar was selected at random. After playing the instrument in each port configuration the subject was asked to indicate whether there was or was not a difference heard between the two configurations. Results of this experiment indicate that the port open and port closed states are not perceivably different. Mottola, R.M. “Blind Listening Evaluation of Classical Guitar Soundports” American Lutherie #96, 2008, p. 54. What has your experience with soundports been? If you are a player or luthier please leave a comment below. I used to play a Lo Prinzi Nova Futura, and found that the ports really opened the sound up. An added bonus was that when playing with ensembles or orchestras the port acted as a natural “stage monitor”, allowing me to hear myself better than I could without them. I think it would be great if they help you hear your own guitar better. I’ve noticed that when I record the guitar from in front it sounds much better on playback then it does when I’m playing it. Maybe that’s just a characteristic of cheap guitars! I really appreciate your article on sound ports as I have been curious about them for some time. Personally I would not add a sound port to my concert classical as I would consider the risk of being unhappy with the outcome too great. I think I would have to fall in love with a guitar that already had a sound port. How about we be honest first and admit nearly all of us play for only ourselves. A port makes the player’s experience way better and takes nothing away from an audience. On my very lightly constructed guitar, all listeners confirm a fuller sound with a half inch by three and a half inch port within two inches of the neck. Closeable ports are very easy to construct. With nothing to lose (except in a collectible), why not enjoy playing more? our local luthier stated that there is no difference, with sound port on the side, what the audience can hear but additional port at back of the guitar would be beneficial, allowing the air pass more freely through the guitar. Has anyone any experience about this? It is interesting that players who have played a guitar with a soundport that have commented here are unanimous in saying they hear a louder sound when playing but the one blind study conducted under rigorous control shows the blindfolded players could not perceive (accurately identify) between ported and non-ported guitars or ported guitars with port open or covered. There is probably an expectation and belief at play here… not as bad as “the king who has no clothes” but perhaps some overly enthusiastic expectations and desires coloring auditory perception. Carruth’s comments indicate a less rigorous testing but with resulted that seemed to indicate only a 1% to 2% yield in increased volume. The ear hears according to a logarithmic scale so a measurable increase in sound volume requires a much larger increase in sound energy or power. More rigorous scientific testing could be done but it seems the players like sound ports and believe they make a difference so why not? I now someone who has developed a micro Tornavoz which is absolutely impossible in its construction to create the Helmholtz Tornavoz effect but he is convinced it makes a difference based on the Helmholz effect a real Tornavoz would create and no amount of science is going to change his perception. It is true that the micro Tornavoz may be having some sort of influence on the resulting sound but certainly not based on the Helmholtz effect, claims notwithstanding. Physics is pretty darn solid on this. Human perceptions are subjective. Sound energy is easy to measure scientifically. 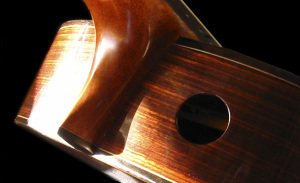 The much respected luthier, engineer and scientist R. M. Mottola chose to conduct a player blind test rather than set up scientific est equipment, but the idea was to test the auditory perception of the player. You read the results above. Sound is not projected to the audience through the top sound hole, it is projected from the vibration of the top. The sides are quite stiff and a sound port does allow some portion of the sound waves inside the guitar body to leak or bounce out of the sound box (body) but apparently not much per Carruth’s non-specified measurement method cited above and per Mottola’s rigorous blind player perception experiment. Seeing the sound port hole is believing, apparently. In the end what counts is pleasing the player and pleasing the audience. My Kenny Hill Signature guitar came with sound ports on either side of the neck. I was surprised by how loud the guitar seemed at first, but after a month I’ve gotten used to it. I find that it makes me aware of the range of volumes I can project. It forced me to play more softly and accurately. for me soundholes do have a significant impact. that being said, i also believe that the guitar is obviously going to decide if it works or not. already bright guitars prob. dont need a port, but i have installed ports on a couple of my duller sounding acoustics with great results. i have a fellow guitarist roomie who i have play the guitar in almost a blind test, he can hear the positive difference as well. i have experimented quite a bit, and have found that the ‘common’ placement, middle upper bout, is more or less the best place, for me. i have added a two more 1″ ports, one above, and one below the original 1.5″ large hole, and have found the the extra port above the large one adds a tad more clarity, but to me the most significant thing i noticed was when i covered the small port below the larger soundhole, there was a greater bass response. the distance between the 3 soundhole is about .5″. 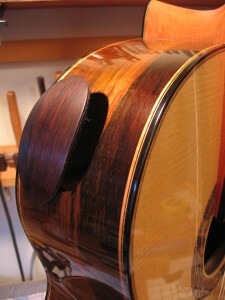 Ray Whitaker is a luthier worth noting who builds in Kasha standard, and his work to me is a great source per soundports. By chance, I was there when Stephan Connor and Eliot Fisk were first discussing whether or not Eliot wanted a sound port on an upcoming guitar. Eliot said no, flatly. Before long, though, he had a ported Connor guitar and has not looked back since. I’ve cut ports in any number of fine guitars for clients. These were consummate classical players who all, without exception, loved them. One insisted on keeping a port cover, even though it cost more to make it. I asked him just yesterday if he had ever used the cover after several years and he said, “No. It sounds so good without it that I’ve never cared to.” Everybody agrees that it improves their playing experience dramatically–as do I, as both a player and the audience. I don’t do physics, so I can’t discuss it from that point of view, but I do have very good hearing and 20 years in the business after a lifetime of playing. I do have to say, though, that it takes a lot of time and care to put in a soundport on a guitar. This is especially true after it has aged for years and the wood is brittle. One MUST reinforce the area around the cut BEFORE cutting, not after, or risk the almost inevitable split in the side when tension is released. 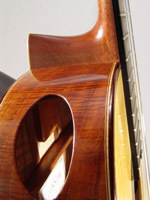 If one can bevel the cutout of the soundhole piece, it can be used as the cover, as the wide part of the cut is the bottom of the cover over the narrow part of the cutout. It’s quite tricky but results in a perfect wood/grain/curve match if done properly. Practice first! I’ve finally drilled it ))) Main port is 80 mm so I calculate side port as 1,618 as small to follow the golden ratio. So the side sound port was 31 mm in diameter. Location od the port on the soundboard is calculated by the goldern ratio as well (80mm +129mm (distance to the soundboard). I found better sustain and open sound on my 70 mm depth parlor guitar and good readability on play ingerrors.